According to beauty and makeup artist Arabella Preston, adviser to Kate, the Duchess of Cambridge, a face cloth to wash your face should be your number one priority. “I couldn't agree more,” says Maxine. It sounds like Kate is a strong believer in what the Brits call “flannels” or wash cloths to clean her complexion. (we like Warsh Cloths and wonder if she's tried them--they're perfect to clean and leave you with a fresh face, plus they exfoliate at the same time, and all you need is water). Many dermatologists and skin care experts, including Maxine Warsh, believe in not using anything stronger than water on your face for cleansing. Celebs from Salma Hayek to Kirsten Dunst to Lady Gaga say they don't use chemicals to wash their complexions (at least some of the time!) if they can help it, report style magazines. In fact, the 'caveman/woman?' routine, which is growing in popularity, advises never using chemically-based cleansers (or even makeup or moisturizers) of any kind. ˆI definitely wouldn't go that far. But I would avoid cleansers and stick to water only as this does cause dryness. Instead, gently wash (Warsh!) with water only and one of my cloths. Washing with water only doesn't dry out or aggravate your complexion in any way and is good for your skin. In fact. It clears away the makeup and grime, even eye makeup, and gives a thorough clean without drying out or leaving a chemical residue like you get with chemical cleansers. These cleansers contain harsh ingredients and preservatives to prolong shelf life and this can play mayhem with your PH balance and leads to over-drying of your skin and wrinkles! 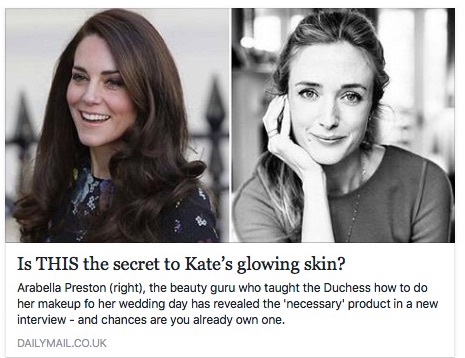 Kate's beauty guru says her lovely complexion is due to using a “flannel”-- i.e. a face cloth! We suggest the Warsh Cloth! Hydration. The body can live a long time without food, yet only a few days without water... some sources say you can survive for a week or so—others it may only be a few hours in extreme conditions. My advice from the anti-aging perspective is to drink water, herbal tea, and fresh vegetable juices consistently. Staying hydrated is a key to cellular regeneration. Get in the habit of drinking 1/2 hour before meals and one hour after meals. p.s. Warsh Cloths are environmentally friendly—they last for months. Wash (Warsh!) the cloths with soap and water to keep them at their best--but use water only when you clean your complexion to keep your skin at its best.